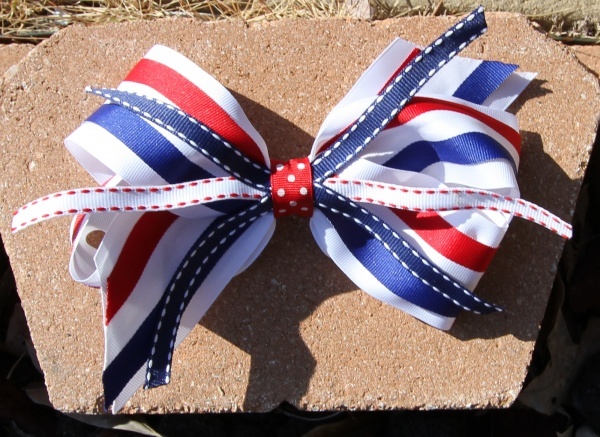 This bow is a mega sized bow that will be perfect for every American Patriotic Holiday. It has the bottom layer with a 2.25" white grosgrain ribbon then a 1.5" red white and blue striped grosgrain ribbon on top of it. The center is wrapped with a red with white 7/8" grosgrain ribbon and is attached to a French clip. then strips of blue with white lines and white with red lines on a 3/8" grosgrain ribbon cross through the middle of this bow. This is the ultimate answer to all your American Patriotic Holidays you will love this over sized bow!